Soil cultivation or digging may be hard work but, if taken slowly, it need not be back-breaking. In fact, here we describe how it can often be omitted or at least minimised. Single digging a bed, border or vegetable patch. All bare soil is suitable for cultivating (or digging). However, digging around plants is best avoided as it damages roots and so can be harmful. Digging is called 'primary cultivation' (and could also be carried out by a mechanical rotavator). This is followed by secondary cultivation to produce a fine seedbed, ready for sowing seed or planting. Clay soils: are best dug in autumn, but avoid carrying out this task when the soil is wet and claggy. Autumn digging allows the frost to break up the soil over the winter, improving the structure. Light, sandy soils: are best dug in spring. However, digging can be carried out from autumn to spring, as long as the soil is not waterlogged or frozen. Because digging leads to moisture loss, complete it before the warm spring weather arrives. Consider hiring a mechanical rotavator to do the cultivation for you if time runs short. Light soils can be handled by a two to five horse power model, but hard or heavy soil needs a larger model. Rotavating wet soil is extremely damaging; wait for drier conditions. Turning over the soil to a spade’s (or fork’s) depth is called single digging. It is worth noting that an alternative method is double digging. This involves inverting a second, deeper layer of soil. This may be hard work but it is perfect for creating new borders and deepening shallow topsoil. 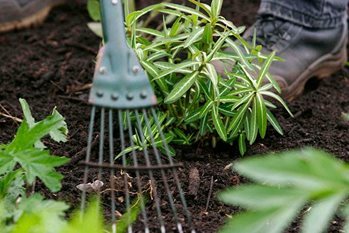 It can also be helpful where drainage needs to be improved or where deep-rooted, long-term plants are to be grown, such as asparagus and rhubarb. Where digging is not practical, consider sowing and planting into undug soil. Firstly, remove the weeds either by hand, with a flamegun or with weedkiller (containing glyphosate). Loosen the soil, if necessary, with a fork or hoe. Unfortunately, really weedy ground or very hard soils are unlikely to respond well. Making narrow beds that can be worked from paths avoids treading on the soil so can be useful.